From the outset, it was clear that top National Education and American Federation of Teachers it's a merged local) officers did not want an escalation of the wildcat strike wave that took place in right-to-work states where the unions are weak and couldn't hold the members back, last spring. It would have been possible to adopt a broader strategy, one that NEA used in its past, when it was something of a union. True, the United Teachers of LA had planned this strike for more than a year. But they could have aligned their strike with the second largest local in the state, San Diego, and with Oakland, pulling out well over 40,000 school workers. That could have sparked a state wide walkout. And, UTLA could have joined the other two large locals and created a Multiple Area Bargaining Organization (MABO). Mabo's set bargaining "minimums," meaning for example, that all agree that a 8% across the board raise, certain class size caps, and so on must be met by each local. It one district is particularly recalcitrant, all districts threaten to strike simultaneously. It's been done, in Michigan for example. The memory is not lost. 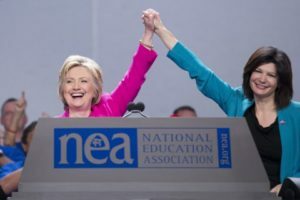 NEA’s Boss, Lily Garcia, rigged NEA’s internal processes to endorse Clinton.But the last thing that NEA president Lily Garcia ($500,000 plus in 2016--living on her expense account) and AFT boss Randi Weingarten (a millionaire) want is a mass solidarity action of class conscious workers who might realize that the two of them, and all their minions, are irrelevant, indeed, Quislings working for the other side. Weingarten made her goals clear in a transparent statement: This is not about a strike wave. It is about LA. 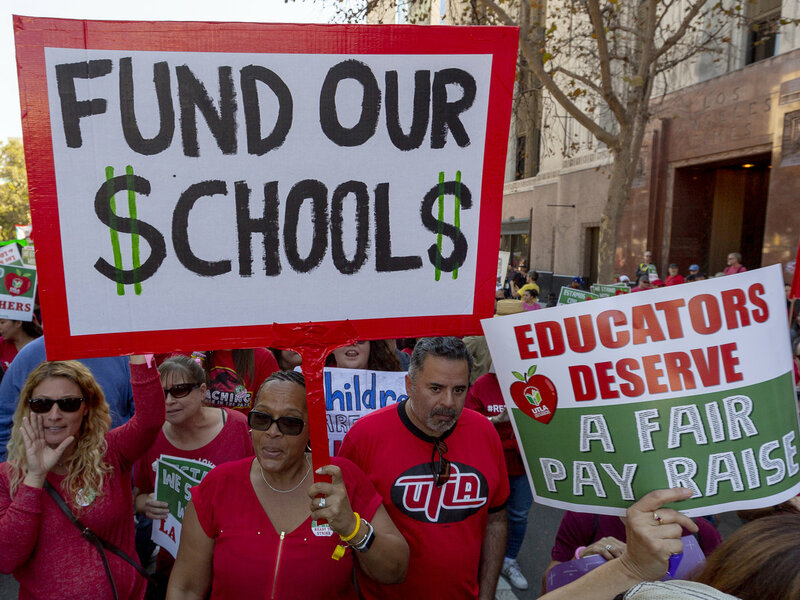 NEA, AFT, and the California Teachers Association could have announced a reasonably generous strike fund. CTA is a $27 million operation. 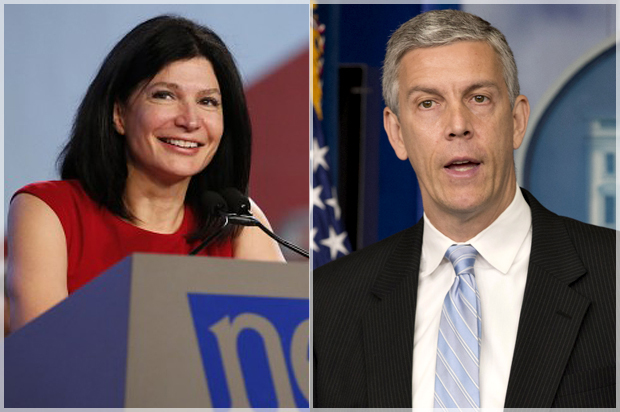 NEA is worth about $1.6 billion according to Mike Antonucci of the "Education Intelligence Agency." But, there was no plan for a strike fund, clearly meaning that the union tops wanted a short strike. A prescient rank and file of UTLA, and CTA, might have set up School Worker Organizing Committees (SWOC), in each school to hold firm and wildcat if necessary, and spread the news of the strike to other systems, encouraging demonstrations, walkouts, social media solidarity, and, best, sympathy strikes. But the school worker movement clearly has yet to grow to that level of maturity. UTLA did correctly identify LA district boss Beutner, as a non-educator, as he is, but they minimized his life role as an investment banker, as easy and rightful target as anyone these days. Such a fine enemy is hard to find, and UTLA didn't play that well, perhaps because NEA and AFT are, at base, corporations themselves. UTLA and its parent unions could have planned Freedom Schools, places where parents could count on to send kids to, at the very least, offset the babysitting role played by many schools. Since, for many people, schools are the centripetal organizing place of life, they could have envisioned feeding kids there too. In those schools, educators could teach that which is rarely taught in schools: Why we must strike--the nature of capitalism and empire--making the Freedom Schools very problematic to any school boss. Instead, UTLA president Alex Caputo Pearl, started making concessions before the strike even began. He gave up a key demand made repeatedly by the rank and file, caps on the number of charter schools, probably because a lawyer from one side or the other told him that's not an appropriate subject of collective bargaining under the law. For similar reasons, he gave up resistance to high-stakes standardized tests. Damn the law. Those wildcats were ALL illegal. This isn't about law. This is about power. We work. They don't. We can control our labor and our work places and 40 thousand and more of us cannot be easily replaced. We bargain because we are strong, not lawful. Pearl had bowed to law in another way--he delayed strike action from the beginning of the school year to January, walking UTLA's ranks through a series of requited steps, like fact finding, that resulted in the fact that many school workers, especially elementary teachers, are fully enmeshed in their kids' lives by mid-year, and, perhaps fired up at the outset, they're quick to want to get back to the children. The time to strike is at the first day of school. Then, Pearl went into secret negotiations with a small team, keeping the ranks in the dark for a week. A picture prior to the strike shows homemade signs pushing for better pay. But the UTLA's signs during the strike said, "On strike for our students." The six percent raise was negotiated before the strike.Pearl, once self-portrayed as a radical organizer, rather like Chicago's Karen Lewis, finally wound up in a smaller secret bargaining session with LA Mayor Garcetti, and cut a deal that represents a thorough-going betrayal. On January 22, Pearl announced his "Victory." A three percent raise for last year and this. That is almost exactly the national inflation rate. So, school worker went on strike for 6 days, lost about 1.5 % of their pay, for what is probably less than the inflation rate in very expensive Los Angeles. There are other "sweeteners" in the contract summary, like promises about more nurses, counselors, lower class size, etc., but there is no "trigger penalty" to address the very likely event when LAUSD doesn't honor those tidbits, and pleads poverty. For example, it's easy to punish a boss who stuffs more and more children in a classroom, caring only about the bottom line and not student learning. If you add three kids to a 30 kid room, the educators' pay is boosted, say 12% (sometimes this backfires with school workers who just want a raise) or, at a certain point, the class must be split in two and another educator hired. Now, the contract allows 46 children in some upper grades--not a good pedagogical situation. Some of my old students from San Diego State teach in LA. Contacting me late on January 22, they needed no prompting to hate the betrayal. They understood the poisoned substance of the contract. They were more angered that UTLA rushed through the ratification vote and, worse, announced the contract was announced as ratified before the votes were counted. The web site also touts an 81% "yes" vote which is, I believe, probably true. While NEA does deceive, trick, disorganize, and con members with a variety of devices, NEA in the past has not lied about member votes--unlike nearly all of the AFL-CIO. So, LA is done for now. Next, probably, it's Oakland and then perhaps Denver. What might have been the most important job action that could have overturned memories of the horrific PATCO loss (lost because the AFL's airport mechanic's union scabbed, in classic AFL fashion) became yet another double-cross, from within. This won't be the last. But it is clear that the class war, so tamped down by consumerism, spectacles, war-as-fun, and other diversions; that old mole is beginning to rise once more. Perhaps the lessons from this set-back will be useful to future fighters.